Too many Christians today still believe President George Bush is a Born Again Christian, based upon his tepid statement of faith and many assertions of God , Lord and Faith since then. In this fourth part of this series, we shall study the most shocking historic truth of all: Adolf Hitler professed faith in Jesus Christ and claimed to be a Christian! He affirmed the Christian faith, never shut down a Christian church, and claimed that his actions during World War II were fully consistent with Biblical teaching and commandment. Most Christians today will recoil at this suggestion, based upon our post-World War II mindset. We know Hitler's fruits were terribly bad. We know he slaughtered 6 million Jews and 12 million other "devalued" peoples. We know he deliberately launched one of the most bloody, terrible wars mankind has ever faced. We now know he was a Satan worshipper, probably without equal in the modern world. We know he regularly prayed the Spirit of Antichrist into himself during rituals and seances held by The Thule Society, the same Brotherhood of Death Society as Skull & Bones -- of George Bush fame. We know Hitler fulfilled the plans of the Illuminati perfectly while in power, and set up the same kind of society that the real Antichrist will eventually set up. From our perspective of post-World War II, we know that Hitler could never have been a genuine Born Again Christian. Yet, from 1933-1939, German Christians looked at Adolf Hitler with completely different eyes. He claimed to be Christian. He regularly invoked the name of "God" and "Lord", he regularly called upon "faith in the Almighty", and he regularly stated the importance of the Christian faith as a foundation for the entire nation! 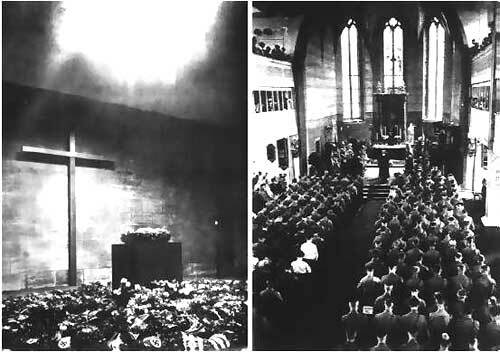 Hitler fooled so many sincere German Christians at least up until World War II began in 1939; however, during that terrible and bloody war, he retained the the support of too many Christians. A quick quote will serve to place matters in focus before we begin our study. A good German Christian woman of some means wrote a letter to a friend just weeks before Hitler committed suicide in 1945. This lady expressed outrage and emotional distress, for she had finally come to believe the rumors, that the "SS" had been systematically murdering Jews all during the war. This lady said, "This is totally outrageous and must stop. Why, someone should tell Adolf"! "My feeling as a Christian points me to my Lord and Savior... I am fighting for the work of the Lord." - Speech, 12 April 1921 ["Adolph Hitler: A perverted Christian? ", Terry Mattingly On Religion] Hitler confesses Jesus as "Lord and Savior". I challenge anyone to show me any testimony from George W. Bush that is as strong as this testimony from Hitler. "The church is certainly necessary for the people. It is a strong and conservative element." ["Memoirs" Albert Speer, p. 95] Later on this same page, Albert Speer noted that Hitler strongly believed that the Christian church was indispensable in political life. "God is with us" - [Calic, Edouard, Ed., "Secret Conversations With Hitler," The John Day Company, p. 6: NOTE: Hitler repeated this phrase exceedingly often in his speeches, and he always drew the applause]. Hitler Flashes Martin Luther New Testament! George W. Bush loves to quote from the Old Testament in order to deceive people into thinking he is a Born Again Christian; likewise, Hitler obtained this old copy of Martin Luther's New Testament to use for the same purpose. These deaconesses assume Hitler read this well-worn New Testament, as did countless other Christians of that era. But, notice that Hitler does not make that claim; he merely remains silent, knowing the conclusion people will reach. "Hitler Leaving Church After Service"
With this quote from Hitler ringing in my ears, I can scarcely contain my anger over President Bush and Attorney General Ashcroft closing down the Indianapolis Baptist Church (NEWS1472] on February 13, 2001, as they sent in teams of soldiers armed with military rifles. Not only did Bush/Ashcroft cross that red line separating church and state that none of our Founding Fathers would have crossed, but he crossed a line that not even Adolf Hitler crossed! Now you can truly understand how despicable Bush's action truly was. Note that Hitler made this boast on January 30, 1939, almost exactly eight months before he launched World War III; using the war as an excuse, Hitler then did raid churches, he did shut them down, and he began to throw ministers and key leaders into a prison, out of which many never returned. Hitler thus seems to hold a higher standard for German schools than we do today for American public schools. In 2 1/2 years of his presidency, Bush has not accomplished one change in the secular, humanist, increasingly gay, and occult agenda that permeates public school curricula! Germany in Hitler's day was "overwhelmingly Protestant", especially Prussian Protestant. Thus, Hitler realized he had to appear non-threatening to Prussian Protestants. In fact, Germany was so taken by Prussianism that Hitler adopted the military uniform of a Prussian general! To us, Hitler looks foolish in his Prussian uniform and his little mustache, but he looked very Prussian, very normal, to the Germans of the era. Note Adolf's reference to Psalm 127:1 in this paragraph and his use of phrases that sound wonderfully Biblical: "Almighty";"Him Who is the last resort"; "holds in His hands the final decision";"Lord God"; and "God". Hitler used these terms far more often than President George W. Bush ever has! "... the fall of man in paradise has always been followed by his expulsion." [Adolf Hitler (Mein Kampf)] Hitler sounds like a "preacher boy" here! History records that many Evangelical, and even Baptist, preachers, teachers, and leaders were seduced by Hitler's "morality" in the early days, as we explain more fully below. Today, we know the full truth of Hitler, and are firmly guided by an examination of his terribly evil fruit, but in the early period, from 1921-1939, Hitler seemed to be a breath of fresh air, as he fought against the loose morality exploding across Germany. Many an evangelical and Baptist leader of this era took public note of Hitler's leadership in this area, and based their acceptance of him on this morality alone. Did Hitler's adherence to a christian-type morality make him a Born Again Christian? Did his repeated use of "God", "Lord", "Almighty", and "Jesus" make him truly and genuinely Born Again? Of course, not, you say, and, you are right! But, today's Evangelical and some Baptist preachers and leaders defend President Bush on much the same grounds! History will record of George Bush much the same way it recorded Adolf Hitler. They are two Illuminists, trained in Satanism in the same type of Brotherhood of Death Society -- Bush of Skull & Bones and Hitler of The Thule Society. In light of post-World War II revelations about the Satanic monstrosity of Adolf Hitler, one can only sit back in amazement as they contemplate how easily fooled these Baptist leaders and pastors were about Adolf Hitler; they casually excused all of Hitler's early writings, such as Mein Kampf and his fiery anti-Semitic speeches from 1921-1934, in which he boldly stated he was going to "line the Jews up against the wall" for execution! And, why did they so excuse these bold evidences of the true nature of Hitler? Because he did not allow pornographic and gangster films, nor women smoking cigarettes and wearing red lipstick in public?! Why, this easy justification of Adolf Hitler by these high-ranking Baptists in 1934 pales in comparison only by today's Evangelical and Baptist leaders justifying President George W. Bush despite his bold gay agenda, his public attack in shutting down a Baptist church, his obvious attempt to gather dictatorial powers to himself using terrorism as the excuse, and a dozen other clear indicators that he is producing only rotten spiritual fruit. "This focus on [Hitler's] personal piety resulted partially from a frontier religious ethic. On the American frontier, where Baptist strength arose in the Second Great Awakening, the most crucial ethical decisions were personal--alcoholism, spousal abuse and violence. Few complex social structures existed on the frontier to attract a sustained moral critique. 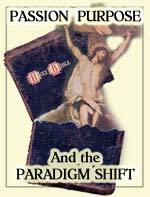 Baptists equated eliminating the sins of the flesh with Christian living." Christian leaders today who are applauding President Bush are guilty of the same disastrous thinking: they are "gulping down a camel" even as they are refusing to acknowledge the major disastrous spiritual fruit emanating from the president. History does, indeed, repeat itself when people do not follow the Holy Spirit carefully, the news carefully, and draw the proper conclusions. Equating Adolf Hitler with the word, "Puritanism" is spiritual blindness of a staggering proportion! M.E. Aubrey even admitted there was much about Hitler that was of great concern to Christians, but he smoothed that problem over by stating that Hitler's "new Puritanism" is so strong that Christians can "overlook much" about him that gives them great concern! In other words, Christians who had personally compared Hitler's spiritual fruits against Bible doctrine, and had concluded he was evil, could "overlook" their conclusions because of Hitler's supposed "new Puritanism"! Today, we see exactly this kind of twisted logic at work! Did you catch that phrase, uttered even as Hitler was beginning to secretly murder Jews: "all is well in Germany". 'Our observation is, that while Hitlerism is doubtless not the ultimate end, for Germany directly or Europe indirectly, it is for Germany a safe step in the right direction. Nazism has at least been a bar to the universal boast of Bolshevism' [Alabama Baptist XCIX 36 (September 6, 1934)]." Therefore, because Hitler strongly opposed Communism, as did international Baptists, it was all right to ignore all the spiritually rotten fruit coming from Hitler and his National Socialist regime! We see this happening today in Ecumenical circles, don't we? Today, Liberal Christianity is allowing itself to be drawn in to the One World Religion of the future False Prophet, through the lie that religions need to focus upon what they can agree, ignoring that about which they do not agree! This is the essence of the Ecumenical Movement today, the ultimate goal of which is to form the religion that will serve the two Beasts of Revelation 13! Right now, in America, President Bush is utilizing exactly the same "Narrow Focus" technique that is blinding Christians from seeing his rotten spiritual fruit! What is this Narrow Focus? It is Terrorism! Bush has so galvanized us of the absolute necessity of fighting global terrorism and ending the states that support it, that he has blinded too many Christians to his true spiritual nature. Thank God "most Baptists in 1934" recognized the true spiritual matters that demanded their attention, and so did not fall into the trap of supporting Adolf Hitler; still, the Baptist leaders who did support Hitler lead many, many Christians astray at a most crucial time in world history. Christians are positionally in the same spot today as in Berlin, 1934. Too many respected Evangelical leaders are urging their people to support President Bush, even though loads of evidence exists that demonstrates his true spiritual nature, and even more evidence that should convince all people that this attack on Iraq is based upon nearly nothing! Why do you think tens of millions of people marched in global Antiwar protests on Saturday, February 15? They had read the news reports warning that our "evidence" against Iraq was tenuous at best, manufactured at worst. Yet, because Christians are patriotic, because they do not want to believe that our presidency could be seized by Illuminists bent on staging Antichrist, and because they are focussed on the narrow specific issue of global terrorism, they are willing to give President Bush their support. "The Cardinal Faulhaber of Munich who visited Hitler at his mountain retreat in Obersalzburg confessed: 'Without a doubt the chancellor lives in faith in God. He recognizes Christianity as the foundation of Western culture' [Helmreich, p.279]." Let us continue examining this Catholic side to Hitler. The fact of history is that Adolf Hitler could not have carried out neither his war nor his Holocaust without the active support of Rome. There were individual priests and nuns who did resist Hitler during the war, at great expense and peril to themselves; nevertheless, the official policy of Rome supported Hitler. "... the thought of a state controlled national church could mean loss of control by the pastors of the Church. Naturally many pastors became concerned; some protested quietly to themselves and others, openly, by forming the Confessing Church. Nevertheless, most pastors allied themselves with the Nazi party and their anti-Semitic views got published in the Protestant press even before Hitler's election into power ... Hitler wanted to combine all the regional Protestant churches into a single and united Reich Church. Of course this meant government control of the Church and a minority of Lutheran Pastors foresaw the dangers. In 1933, a few Protestant Pastors, namely Martin Niemöller, Dietrich Bonhoeffer, Karl Barth and others formed the "Pastors Emergency League" which later became known as "The Confessing Church" to oppose the state controlled Nazi Church. "It bears some importance to understand that Germany did not recognize the Confessing Church as an official Church. Not only the Nazis, but all other Protestant Churches condemned the Confessing Church. They thought of it as a minority opposition that held little power. 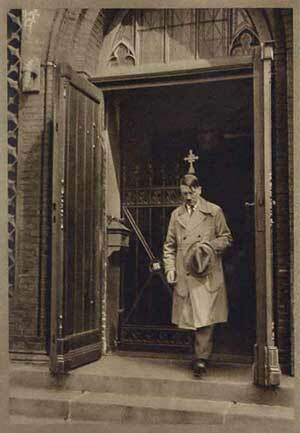 The vast majority of German churches supported Hitler and his policies against the Jews." ["Christianity In Europe During World War II, by John Walker June 2002]. Once again, there were numerous individuals who risked their lives and the lives of loved ones, to resist Hitler and to save the lives of many Jews; however, the "vast majority of German churches supported Hitler and his policies against the Jews". Too many Evangelical and Baptist leaders supported Hitler, especially during the early years, 1921-1939, when their determined opposition might have made a difference. This quote brings us squarely back to "Words", does it not? Just as too many Evangelical and Baptists supported Hitler on the basis of some of his words alone, ignoring other words and deeds that would have revealed his true nature, so do many Christians today support President Bush on the same basis. In Parts 1 through 3 of this series, we have shown you the true side and nature of President Bush. 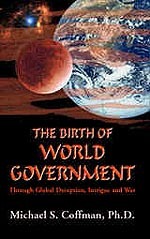 As Bush leads the world into the New World Order, remember that this system he is attempting to establish with United Nations cooperation is the "Kingdom of Antichrist". 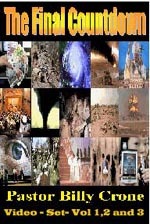 Further, we demonstrate in Seminar 2, "America Determines The True Path of History", the Bush New World Order is essentially identical to Hitler's. As you contemplate how you will react to this coming war, remember it is being fought to establish Antichrist. Two Illuminists at key moments in world history played the role of "Christian" to their people, deceiving too many, including Christians who should have spotted him in a "New York Minute"! 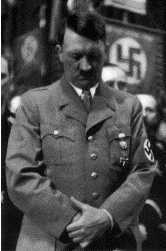 Adolf Hitler -- Illuminist trained in the Brotherhood of Death Society in Germany, known as The Thule Society. Both men held center stage at a time when Antichrist was to attempt a successful entrance on the world stage. Both men claimed Jesus as Lord and Savior. Hitler's effort to stage Antichrist was unsuccessful because God's timing was not right; if Bush is to be successful, it will be because God's timing is right this time. But, both men deceived many.